Review: "First Signal: First Signal" - Sea of Tranquility - The Web Destination for Progressive Music! Canadian band Harem Scarem started out in the late eighties, performing together for many years until their final studio release in 2008. Now in 2010 fans of that band have a new similar option thanks to First Signal. 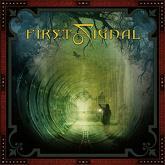 First Signal is the new melodic rock project from ex Harem Scarem lead singer Harry Hess and producer/bass/guitar player and vocalist Dennis Ward (Pink Cream 69). Joining these two to complete the line-up are Chris Schmidt on drums, Michael Klein on guitars, Eric Ragno on keyboards and more vocals from Darren Smith(also ex Harem Scarem). First Signal's self titled debut has eleven tracks, the first "This City" is a catchy and not to mention radio friendly rocking tune. "When You Believe" builds into another vibrant feel good song, and "Part Of Me" is also a good track as well. They then follow this with "Crazy" a slower emotional rocker of a ballad with a chorus that leaps out at you. First Signal get into the groove with "Goodbye To The Old Times", and the harder "Naked Desire" was another track that I really enjoyed. Actually First Signal have recorded a great deal of appealing melodic rock on this CD, with no great surprises it's an album that gives you what you would expect of such a release. First Signal features top production and the kind of melodic songs that will make you feel like you stepped back in time.